After my latest article about the 2018 watch trends in the vintage watch market, I decided to go a bit more in-depth on the different styles of vintage watches. Today we’re talking dress watches! I have to admit, dress watches aren’t for everybody. Personally, I never wear them. I like a good heavy watch on the wrist and a watch should be at least 36 mm without the crown, so most of the times I choose to wear a chronograph. Besides, dress watches don’t really fit my wardrobe. But you can’t argue with the fact that they’ve become more and more desirable and collectible and many collectors love to wear them because of their simplicity. All you see is a straightforward dial and a watch that tells the time, no complications. One of the reasons why collectors start buying vintage dress watches is because most of the vintage chronographs and watches with complicated movements are insanely expensive for the average collector. Good clean dress watches from decent Swiss brands are also rising in price, but for now, they’re still affordable. I began to notice the serious increase of demand for vintage Swiss dress watches sometime mid-2017. Collecting vintage watches is all about condition. Certainly, dress watches are no exception. Many collectors love their watches in pristine condition, but some collectors (such as myself) can also appreciate a nice time correct ‘patina dial’. Of course, you have to be aware that there’s a big difference between a watch with patina and a damaged watch. Water damage for example. You should avoid these because the movements will also have suffered water damage and some (hard to get and expensive) parts will be rusty. Another thing that’s very important is that you should always try to find unpolished cases with the original factory finish. Many vintage dress watches are polished. Owners don’t like to see scratches (because it’s a dress watch right?). The problem is that every time you polish it, you remove some steel from the case. The case loses the sharp edges and you’ll end up with a slightly different watch. Do this for a longer period and the case will look totally different from the original. Crowns are often changed on dress watches. Most of the watches from the 1940s until the 1960s are hand-wound. It’s understandable that a crown is worn-out after or 60 years of use. You can still find some good examples with the original crown if you’re lucky though. A replaced crown doesn’t have to be a deal breaker, by the way. You can buy original crowns on eBay and from specialized sellers. Don’t miss out on a good deal if all you need to do is replace the crown for a correct one. Let’s talk brands now! In the vintage watch market, there are a few brands that you can’t overlook. You can’t ignore Rolex and Omega when you’re talking dress watches. This, of course, being the ‘higher end’ of the game. 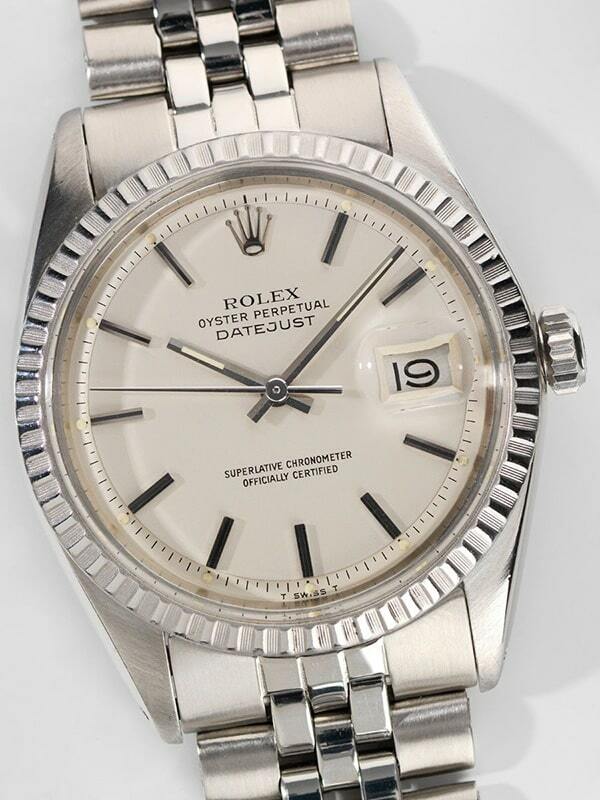 Rolex isn’t known for their dress watches, but they made a few nice models that can be considered dress watches. First of all, the Datejust. I already mentioned the Datejust in my previous article, so I’m not going in too much detail here. It’s still one of the most affordable Rolex models out there. They were produced in large numbers because of their popularity. You can find a good specimen from the 1970s – 1980s for around $3400-4000. Another interesting dress model in the Rolex line is the Bubbleback. Introduced in 1933 as Rolex’s first automatic movement, it’s not in Rolex’s higher price range today (due to its rather small diameter being mostly 31-34mm). For people with a ‘limited’ budget, but who really want to own and wear a Rolex, I’d suggest taking a look at the Oyster Precision (34mm). You can find them for $1700-2300 in good condition. 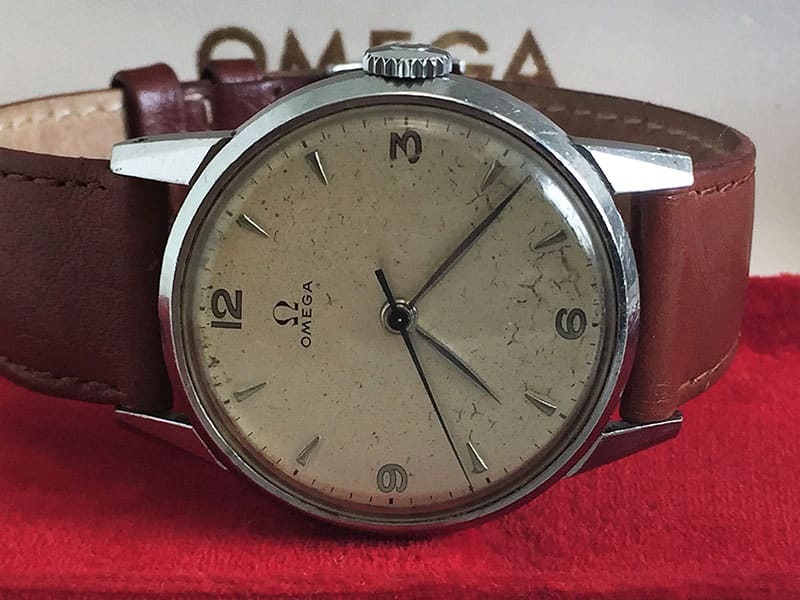 There’s a wide range of vintage Omega dress watches available. Measuring from 30mm to 38mm. Omega made a couple very nice bumper automatics during the 1930s and the 1940s. Most of them being around 33-34 mm without the crown. Some of them have a nice military style dial and fetch a premium because of it. Today, you can find these bumpers in good condition for around $700-800. I still remember buying them 4-5 years ago for $250-350. But to be honest, these aren’t suited for daily wear. Parts are rare and expensive, and a bumper movement is also more fragile than a regular automatic or hand-winder. Luckily there are alternatives! The Seamaster line (introduced in 1948) has a wide selection of cases, dials, movements, hands, and diameters. Black and military-style dials are always worth a bit more than the others. Be very careful with black dials though because a lot of them are redials. Automatics are also a bit more expensive than hand-wound watches. But the variation in price is small when it comes to Omega dress watches. You can find a nice Seamaster in the $450-900 range. As mentioned before, ‘over-sized’ Omegas can go for $1100+ because they’re rare. If you’re on a limited budget, it might be a good idea to check out the Genève line. You can sometimes find dress watches from the 1960s and 1970s, even today, for around $350. If you’d like to add an Omega hand-wound watch to your collection, I’d suggest a watch with a caliber 2XX. Very solid movements and you can be sure they’ll rise in value. Another caliber that I would suggest is the 30T2. These are a bit more expensive because it’s a caliber also used in military Omegas. It’s one of the best Omega movements ever made. You can find these for $650-1000 but they’re climbing really fast, so you better hurry! If you want an automatic movement, I’d suggest a watch with a 55X movement (the 56X and 57X series aren’t bad). Together with the earlier mentioned 30T2, they’re among Omega’s finest movements. You’ll find the 55X movements in watches from the 1950s and 1960s. Prices are also $550-800 for a good clean specimen. Of course, there are other brands that made pieces worth mentioning. Almost all vintage watch brands made dress watches. It’s impossible to discuss every brand or model, so I’ll speak from my own experience as a collector. Longines is a brand that used to be a lot more respected than it is today. They made some very good movements and they’re highly sought after today! I should at least mention the 1940s model with the sector dial and the 12.68Z movement. It’s sometimes called the Longines Calatrava online although you should be careful because it doesn’t have anything to do with a Patek Phillipe. Longines launched a reissue in 2017, which means that prices of the original ones will continue to go up. A completely original example will cost you $4500, but the problem is that many have been redialed and polished. Not every Longines is this expensive though. You can find nice Longines dress watches for around $300-550 (with the solid Longines 30L caliber). An alternative that’s a bit cheaper is Wittnauer. Also from the Longines group but most of the times, they’re a bit cheaper. Two other brands that made some fantastic looking dress watches. Lately, these brands have also gone up in value. Of course, Eterna has their own in-house movements with a ball-bearing rotor. I’ve also seen some nice Enicar dress watches with ‘linen’ dials ( for around $175-300). An Enicar dress watch is still a bit more affordable than an Eterna (in my own experience). You can find a nice Eterna dress watch for around $350-550 today. The Eterna Kontiki is certainly worth looking out for! Some people just want a good quality dress watch that you can wear without worrying about the value. Tissot is a brand that made some very nice watches from the 1940s up to the 1970s. For smaller wrists, there are some nice 31-33 mm Tissots available from the 1940s, some with military-style dials. You can still buy them for around $250-350. They’ve become a bit more collectible during the last 2 years, but they’re still affordable. One model that you can look into is the Tissot Antimagnetique. Another line from Tissot that’s worth checking out is the Seastar line. Lots of variations in cases, dials, and movements, but they’re all still quite affordable. You can pick up a nice 33mm-35mm Tissot Seastar for around $250-350. 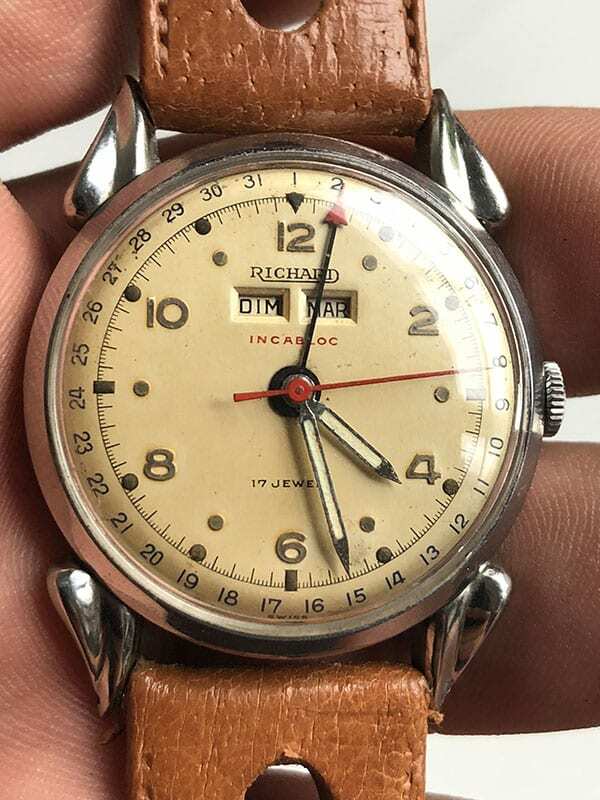 Another brand that made some interesting watches is Richard. Not that well known but certainly worth looking into! They made watches with high-quality movements (also chronographs) and they’re known for their special ‘fancy lugs’ cases. You can still buy Richard watches for a reasonable price. Depending on the model and diameter, they’re usually $200-400. Another brand in this category is Zenith. Prices of Zenith dress watches are still relatively low, compared to their divers and chronographs. You can find a neat Zenith dress watch for $350-700. Universal Genève also has some attractive dress watches that you can buy for around $550-800. And another one of my favorite brands in this price range is Lemania. Always worth buying! All of these will go up in value, just not as fast as the divers or chronographs. You’ll often pay a premium for a golden case, but I’ve noticed a change when it comes to the material of the watch case. Some watches with a steel case are actually more expensive than the same model in gold (mostly chronographs). One of my first ‘luxury’ pieces was a nice 18K gold Powermatic. I still regret selling it 6 years ago. Finding one in good condition is very hard at the moment and you’ll have to spend around $2000-2500 for a good one with an 18K gold case. Of course, there are other Jaeger- LeCoultre dress watches that you can buy for around $1100-1700 (hand-wound or automatic). It’s one of those brands, just like IWC (quite the same price range) that just made a lot of dress watches, so you have a lot to choose from. Brands like this are always good as an investment because they’ll always be considered collectible. I also noticed that watches with square-shaped Art Deco cases are a bit harder to sell than watches with a round case. The main reason is that an Art Deco watch looks smaller on the wrist than a watch with a round shape. In my next post, I’ll discuss dive watches so don’t miss it. Good luck hunting for your next timepiece! Very nice Matthias! Well written! interessant als horloge liefhebber om ideetjes op te doen. Prachtig die Richard! Leuk artikel ook !